We drive across it, many of us on a daily basis, and mostly we don’t pay it much attention. But looking down from the top of the bluff, or from either side along the street or riverfront trail, it’s easy to see why Rock Island’s Centennial Bridge has become an icon for the entire Quad-City area. Its five arches gracefully skipping across the Mississippi are light and open, yet the strong “X” cross braces convey sturdiness and strength. Bridges are important here, where a wide river separates communities. For decades, the Government and Sylvan Bridges provided the only land connection between Iowa and Illinois here. Usually folks took a ferryboat across the river. Then people started buying cars and wanted to get them across the water, too. In 1935, a newly-formed Davenport Bridge Commission built an elegant suspension toll bridge between Moline and Bettendorf. Now it is the eastern (Iowa bound) half of the I-74 “twin” bridges, and its future is doomed. For years, Rock Island wanted another land connection across the river. In the 1930s, a joint Davenport-Rock Island commission studied a proposal to build a tunnel from the foot of 18th Street in Rock Island to Brady Street in Davenport. Even before Rock Island Mayor Robert P. Galbraith was first elected 1937, he was determined that a crossing would be built. Since the tunnel concept had been eliminated by that time, a bridge it would have to be. When the commission told the mayor that even a bridge would be impossible without massive federal intervention, Mayor Galbraith was undeterred. Davenport and Rock Island would build their own bridge. Then Iowa refused to take part in any funding efforts, so the mayor said that Rock Island would just have do it alone. Although unsuccessful in obtaining any WPA funding, he finally developed a plan to sell revenue bonds for construction. The bonds would then be paid off by the tolls from bridge users. Rock Island was now in the bridge business. An engineering survey of the Illinois shoreline suggested 15th Street as the best bridge location, linking to the foot of Western Avenue in Davenport. However the city of Davenport insisted it be moved a block west to its current Gaines Street location, which resulted in the need for the curve at the Iowa end of the bridge and also added $40,000 to its cost. The bridge was designed by the firm of Ash, Howard, Needles and Tammen, a company still in existence as HTNB. R. N. Bergendoff, the brother of Augustana College president Dr. Conrad Bergendoff, directed the engineering efforts. Engineer Edward (Ned) Ashton of Iowa City was reported to be the chief designer of this “tied arch” design for the bridge. Each arch is structurally independent of the others. The two center arches are higher than the end ones, providing a wider navigation span beneath. 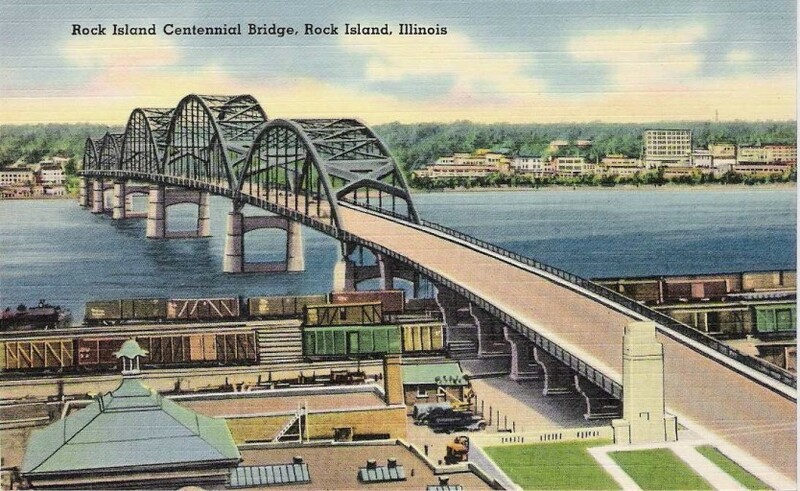 During its construction year starting in March of 1939, it was informally called the “Galbraith Bridge.” Two months before its dedication on July 11, 1940, Mayor Galbraith firmly declined to have the bridge officially named in his honor He suggested, instead, that it be named the Centennial Bridge, in recognition of Rock Island’s upcoming centennial year. This postcard, published in the mid 1940s, is a view is from atop the courthouse. The structure in the left foreground is a long-since-removed cupola on an also removed dome. The image on the card appears to be a drawing rather than a photograph, since the stone entrance pylons are shown, but the original waterfall fountains are not. The grooves around the top of the pylons match a similar detail on the Bridge Commission building at Second Avenue. Although all five arches of the bridge are visible, the streamlined maroon center toll booth is not shown. A major change in the bridge came in 1960 when new access from First Avenue was added. At that time the waterfalls were rotated slightly so the roadway could be widened. At some time, a large clock above the tollbooths was removed. In 1988, the bridge arches were lighted, making it as visible at night as it is in the daytime. Finally, in a dream come true, the State of Illinois assumed the maintenance and repair of the bridge in 2005. Prior to the state’s acceptance of the bridge, many changes were mandated. Although tolls were eliminated in May, 2003, it took another two years of construction to remove the center toll booth, modify the approaches to accommodate increased traffic, and make many other repairs and improvements deemed necessary. When the approaches were modified, the historic pylon on the west was dismantled, the stones numbered, and then reassembled a short distance away. The skill and care exhibited during that process earned City of Rock Island a RIPS Preservation Award for 2005. This article by Diane Oestreich is slightly modified from the original, which appeared in the Rock Island Argus and Moline Dispatch on June 30, 2002.